As many of the previous reviewers have stated, this is truly a magical place. If you are looking for valet parking and a concierge, this is not where you should wander. If you seek out adventure, incredible people, stunning vistas, and a chill vibe pre and post hiking in the High Atlas, you need to stay here for at least one night. Getting to the front door by foot with a mule as your porter is the first hint that this place is different. The staff is professional and uniformly stellar. The rooms are comfortable without being the Ritz. Note: WiFi is limited here, but if that is your main concern...do not bother to come here. Treks from here with a Berber guides and Berber mountain chefs will forever live in your memories along with a feeling inside that you are helping the local community in a very real way with your 5%, your payments to your mountain guide, and any other financial support that you feel inclined to contribute. Just remember that a stay here is whatever you choose to make of it. If you let the little annoyances get to you, it will color your stay. If you allow the space to wash over you and resonate within you (forever), it will have been a great stay! P.S. Mohammed was the best mountain guide ever! P.P.S. Lassen (@ the Reception Desk) was always amazing & helpful. Just returned from what I would call an oasis of peace under all aspects. The mountain context expressed at best with a typical architecture equipped with every comfort. Cosy and professional staff, clean place, Excellent Kitchen (the best I tasted the ten days in Morocco) and light served in the terrace with mountains view. Top the lady making bread at the moment. Private room hamman for the after lunch and stunning heated reading room with snow view and villages. Super recommended. We stayed at the Kasbah Du Toubkal for 2 nights in the room next to the water feature called Ainya (I’m not now sure of the spelling). The Kasbah gets 5 stars for location and ambience. Our room had a wonderful mountain view and enabled us to peep into the lives of the Berber people looking after us. The children in the house below our little balcony (with comfy deckchairs) entertained us with an impromptu drum and song concert on a wet Saturday afternoon. They were filming themselves. It was a privilege to see their care for each other, their love of music, and their unconscious behaviour (so different from the mindless selfies encountered elsewhere on the trip at every single sight and monument). Our room was the size we expected, but with additional space in the form of a dressing area. The bathroom was sufficiently spacious for our needs. Toiletries are provided, with lovely soap. I didn’t get the hang of the Moroccan shampoo which was my fault - it does add volume to the hair and I ended up looking like the Donald after a visit to the hairdressers! A hairdryer is found in the room and a kettle with tea and coffee. Water and a small tajine of nuts are supplied as are generous soft drinks in the mini bar. Slippers and local robes are also provided. We had a lot of rain while we were at the Kasbah. I failed to take a raincoat - don’t make the same mistake! After the rain the room did feel a bit damp and perhaps being next to the water feature didn’t help. The room was however spotlessly clean and comfortable. Meals are taken in a communal dining room with wood burning stoves at low tables. There is no menu. Meal portions are very, very generous. We found the food to be delicious. Breakfast included pastries, cereals, juices, pancakes, lovely honey, and eggs if requested. Dinner was Moroccan food of very high quality. We loved the tajines and the apple tart was a triumph of pastry cooking. No alcohol is served. Service is quite speedy, and would benefit from being slowed down a bit. We found some staff members to be a little shy and some to be charmingly cheeky. That’s a good mix. Hossein, our trekking guide, got the balance between chat and silence just right. He took us on a memorable 4 hour walk. We passed through many villages on the way. We had the lovely surprise of an al fresco lunch of sardine salad and kefta and rice with fresh fruit and mint tea cooked by Hassan while we lounged on cushions and looked at the view. All carried up by mule. This is what 5 star experiences are made of. Some parts of the Kasbah fabric are more 3 star than 5 star. Remember that this is a trekking lodge. It is in the mountains at the end of a track up from Imlil. The luggage comes up by mule and you follow behind. This is part of the experience. When it rains mountain lodges can be a bit uncomfortable. Take a walk and look at how hard life is in the villages before complaining. If walking isn’t for you, stay at a certain businessman’s place lower down the mountain (Charles Bronson in the words of our driver). The Kasbah won’t miss you! We will never forget our 2 nights here. Thank you! The word 'unique' is often overused in lodging reviews, but ask yourself when is the last time you rode a mule up to a kasbah in Morocco's Atlas Mountains for an overnight (or longer) stay? You can drive, taxi, or bus to the Berber village of Imlil, but from there to Kasbah du Toubkal it's hike or mule (either way, mules carry your luggage) because you can't drive your car to the kasbah. And just as well, because once there, you are in a different world – quiet, serene, secluded, semi-primitive, yet with nearly every necessary convenience and comfort, all in well managed eco-friendly surroundings. After stepping through the kasbah's massive gate and working your way up through the impressive multilevel gardens, you'll be treated at reception by the friendly local Berber staff serving traditional mint tea along with a warm welcome. No cookie-cutter hotel, you'll find genuine hospitality is stressed over frilly hotel services (don't expect an evening turn down or overnight shoe polish), yet all your needs will be met. Room types are wide ranging – from dormitory style with shared facilities to comfortable private rooms. Ours was a large deluxe room in its own casa-like building with private bath, large bed, and a terrace with mountain views. Toasty in-floor heating was welcomed on a chilly late April night at an elevation near 6,000 feet. The well tended gardens are a skillful mix of fruit trees, herbs, and ornamentals woven together with pathways and paved areas perfect for simply relaxing, soaking up the sun, honing your artistic painting skills, taking in the spectacular mountain scenery, or merely enjoying the cats at play. Traditional high mountain Moroccan style dinners (not always included in the room price) and breakfast (included) are served in a cozy, candle-lit dining area. Expect a limited menu but more than satisfactory food and service. Be sure to notify the staff of any special dietary requests ahead. You may bring your own wine, but out of respect for the local Berber community none is offered on the menu. Room rates may seem a bit steep, but you will be enjoying a truly unique, perhaps once-in-a-lifetime, high mountain experience that's well worth the splurge. "We had no idea of the surprise that awaited us after a long day on the road! To Imlil is like a country drive with a rich diversity of countryside and small towns. Upon arrival in Imlil staff from the Kasbah met us with a donkey to carry our bags up the hill to a very fine retreat. The complex, once abandoned, is like a fortress on top of a peak amongst the mountains. The main building is so welcoming with lovely kind staff, a library, hamman, dining room, open fires, and various indoor and outdoor spaces to relax and soak up the views and surroundings. Dinner was the best meal we had in our stay weeks in Morocco. Lemon chicken cooked superbly. Upon return to our room, down the garden path, we found hot water bottles in our beds. Being able to relax in the morning and simply enjoy the Kasbah was so refreshing. Watching workers plant herb gardens, cats playing amongst the work, hikers climbing the peaks, and locals going about their business. 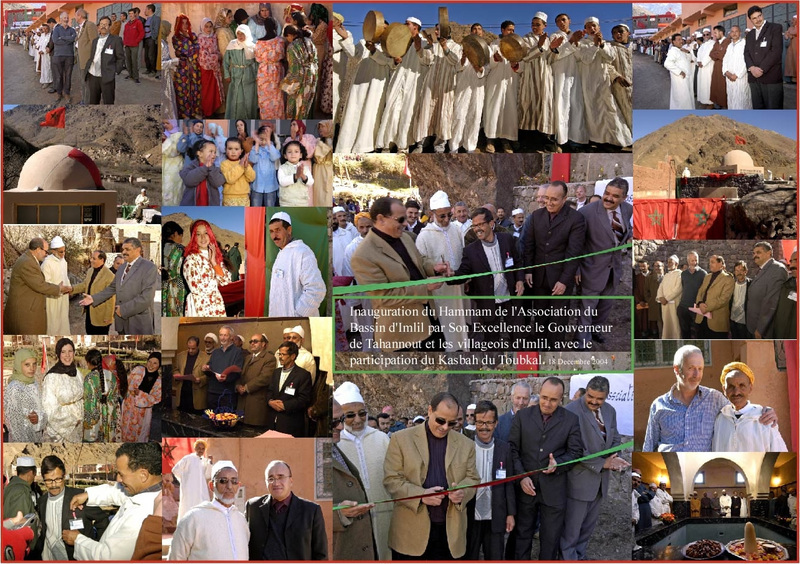 Provided is a copy of Reasonable Plans - The story of the Kasbah du Toubkal - an excellent account of the rebuilding programme and the initiatives supported now." "It was one of the coolest places I've ever been"
"Last night we stayed at @KasbahduToubkal in the High Atlas Mountains, Imlil, Morocco. We drove through some sketchy roads for a few hours from the coast (getting lost a few times) only to find out that you have to hike up to it. After the short climb we found ourselves in what can only be explained as something out of Harry Potter or Lord of the Rings for lack of a better explanation. Tradition food, hammams, and robes. It was one of the coolest places I've ever been. Although our stay was only one night it is something I will always remember. If you find yourself in Morocco, I highly suggest checking it out." One of the best experiences in Morocco is to stay in Kasbah Du Toubkal. From Casablanca, we were driven through Marrakech, through the villages in the mountains, valleys and arrived at Imlil. A short hike later we arrived at the door of this enchanted place. The door opened and transported us to a garden filled with apple, orange, fig trees, flowering bushes, and fountains. Lahsen welcomed us with gracious Berber hospitality, washed our hands with orange blossom water, offered dates dipped in cream and cold water. The view of multiple peaks including Mt. Toubkal surrounds the hotel. One of the most serene and beautiful experiences in Morocco. We landed in Casablanca and caught the train at the airport to Marrakech via La Oasis (3hrs). Rasheed (awesome guy) picked us up from the train station on time, as we had organised this via the Kasbah and drove us to the town of imlil. Our rucksacks were mounted on a mule and we walked through the village and up the hill to the Kasbah where we stayed for 3 nights. Honestly, it was one of the best places I’ve been for hospitality and meeting new friends. We hiked around 4kms a day around different villages with the Kasbah friendly staff and our new friends, sat in the roof top every morning and evening where everyone chatted for hours. The food was good old fashioned cooking and there was plenty. Bring wine if you wish and they will supply glasses. The ethos behind the place is admirable. They help develop the town, employ around 40 locals and everyone is contributing to becoming self sufficient. Buy your trinkets, rugs and seat puffs here, as you help the community. You never tire of the views or multiple calls of prayer across the valleys. Breathtaking, easy travelling and a must in Morocco. One of the Most Memorable Hotels I Have Ever Stayed At! Just visiting this hotel is a memorable experience. You arrive in Imlil and a guide and donkey carry your bags up the hill to Kasbah Du Toubkal. Once you arrive views are amazing in all directions (both inside and out). The staff is very friendly and helpful. The dinner and breakfast area great. At the crows-nest is a great spot to sit and watch the surroundings. I have been all over the world and this is definitely one of the most unique and memorable places I have ever stayed. Highly recommended! This hotel is situated in an amazing location. The hotel was thoughtfully renovated and built up from a historic structure, retaining a connection to history and to the surrounding communities. Every aspect of the hotel is comfortable and luxurious in a way that respects the remote area it's situated in. The staff are great, you can get guided walking/hiking tours throughout the beautiful area. We took a guided hike and were met on a nice plateau by a cook who made us a great hot lunch. One can just relax on the lovely hotel grounds as well. We had the senior suite that was amazing. A fantastic fireplace, great balcony overlooking the mountains and orchard, and two very comfortable downstairs bedrooms and bathrooms. We had booked the junior suite but were offered the senior suite because of the two bedroom configuration. The senior suite is MUCH nicer. The food is great. The homemade bread is fantastic and the entrees were plentiful and delicious, made from local ingredients. There is no alcohol sold on the premises but some people brought wine and the staff was happy to help serve. The Kasbah is a wonderful retreat, beautifully situated in the blossoming Imlil valley. We were overwhelmed by the hospitality of the staff, the panoramic views from the terrace and the warm and cosy dining room with open fire. Beautiful rooms, hammam, food - a very peaceful and enjoyable place. Our personal guide for 5 days, Abdeslam, made the trekking a joy - his great knowledge about the mountains, the flora & fauna (and birds!) was impressive. He told us a lot about the berber people and the villages in a very loving and respectful way. We made a 3day trek to Azzaden valley (sister lodge) with Abdel, a mule and cook Hassan who made the most delicious food with fresh vegetables and tajine in the middle of nowhere - warmly recommended! And not to forget - by visiting this eco-friendly Kasbah, you are contributing to projects like Education for All and The Mule Project. Thank you, Kasbah staff and Abdel! We stayed in Kasbah Toubkal for 2 nights; was upgraded to an Apartment facing Mt Toubkal. The apartment was on 2 floors; upstairs with a family room and a seating area with full glass windows and balcony with an incredible view. We had 2 clear days and sitting on the balcony, the snow capped mountains felt so close. It was tranquil and the air fresh. Kasbah Toubkal was the highest hotel in the Imlil area. From Parking you would need to walk up about 200m; with the mules carrying your luggage. Imlil village has many hotels/B&Bs but the village is dusty and noisy. We packed for the cold evenings (-2Cel) but the room was warm and very comfortable. There was floor heating. We had a large bathtub and soaking after a couple hours of hiking around the area (the lost villages etc) was nice. We ate both dinners at the Kasbah. The Moroccan food was one of the best we had on our trip. Lunch was served on the large terrace with great views of Mt Toubkal. Service was excellent especially Lahcen who helped us glue some parts of a shoe that had come apart after the hike. All the service staff are happy, helpful and friendly. Kasbah Toubkal was a wonderful haven. We didn’t want to leave. The Kasbah is an eco lodge. The project is aimed at giving employment to people in the villages around Imlil (from sourcing of building materials, decorative items & food to giving part of the proceeds back to the community). The only thing that took a bit of shine away was the Kasbah also rented out 2 dormitories. As the dorms are around the main dining area, it can get noisy. But once in the rooms or on the terrace, all’s good. We hope to come back. Unique place, 1700 metres up with stunning views all around of the Imlil valley. Staff go out of their way to offer traditional Berber hospitality. The area is unspoiled & in many a role model for how to accommodate tourists without ruining it. Huge benefits for the local community accrue from the Kasbah … the walking is tough but the rewards tremendous. If you can trek across to the lodge in the next valley for an unforgettable experience. We loved it despite the pains in our legs … which soon recovered anyway. We stayed for one night at the Kasbah after summitting Toubkal the day before. If we had known how tired and sore we would be, and how amazing this lodge was, we would have stayed a few days to recuperate! The rooms are beautiful, authentic, and unique. The food (as was all the food in Morocco) was extremely good. The service was impeccable. The grounds are gorgeous. Two things that I loved were the Berber robes they leave in the rooms for you to wear (I loved mine so much I just emailed to ask if I could buy one) and the water tap outside the front door, where you can fill your water bottles with spring water. Plastic bottles are obviously an issue in Morocco, and so I thought it was really great that they provided a source for good water. If you go, you should read the book that they leave in each room that tells the story of how the Kasbah started, and the foundation it helps support. Amazing place, with an amazing mission. Stayed February 2016, travelled as a couple. We stayed at the Kasbah du Toubkal for two nights in late April. Our only regret was not spending more time here. The Kasbah is very up front in not representing itself as a five-star hotel with every modern amenity. So stay away if you require that. The place is on the rustic side but that’s a big part of its charm. We felt the Kasbah was still quite comfortable with cozy rooms, wool djellabas, private and clean shower and toilets in each room. And most importantly the great staff and otherworldly surroundings. Wifi was spotty but you’re not really there to be tethered to your devices. Fabulous trekking for all levels. Hearty tagines and the best homemade yogurt at breakfast. We stayed in the bottom room of “the tower” and felt we had the best room. It was spacious yet felt cozy and we loved its every nook and amazing mountain view. We checked out other rooms as we were traveling with a group of friends. Although each room had its own charm we felt lucky to have ended up in the tower. You can go up to the tower roof and enjoy the view. We purchased the aluminum water canisters with the Kasbah logo for 100 dirhams each as a great souvenir to remind us of our amazing hike in the Atlas. They can be purchased from the front desk. Given the location, requiring donkeys to porter bags for about a 20 minute hike uphill where cars can’t access, what the owner has accomplished here is remarkable. National Geographic also lists the Kasbah on its list of unique lodges in the world. Indeed, this was a lifetime experience for us. Of the hundreds of hotels I’ve stayed at in my life traveling extensively for work and pleasure, the Kasbah du Toubkal is definitely in my Top Five. Prior to our trip Ellen and I seriously considered staying at the sleeker and sexier Kasbah Tamadot, Sir Richard Branson’s Retreat down the road, and we probably would have if the price had been right. I’m sure it’s beautiful, and swanky, but I doubt it could match Kasbah du Toubkal in terms of genuine hospitality and charm. And those qualities are priceless. If you like to stay in a Novotel, don’t come here! This is not your average hotel, but it didn’t make Conde Nast’s Top 10 High Hotels of the World for nothing. An hour and a half’s drive from Marrakech (they will arrange transport for you), you are dropped off at Imil, the nearest village; from there, mules take your suitcases and you have a 20 min hike upto the Kasbah itself. As previous reviewers have said, this Kasbah (which means ’rural fortress’ I Googled it: they have Wi-Fi access! ), nestles high up in the mountains and is surrounded by local villages. In fact, the villages are supported by the Kasbah, which also runs a school for girls, giving them the education they would find it impossible to get otherwise. The only sounds you will here up here are children laughing, roosters crowing and the calls to prayer of the Muezzins echoing round the mountains and villages. Berber hospitality is world renowned, and here you humbly accept it first-hand; because these poor but utterly nice people look after you very well. They will guide you through the mountains for walks- twice a day if you are upto it, but make no mistake, you are high above sea level here and may feel a little breathless at first! However, we are in our 60s and not particularly fit, and managed to get up and down to the village - you can buy rugs, jewellery and all the other artisan crafts you would expect to find in communities like these, who rely heavily on tourism for their livelihood beyond subsistence level - but also we hiked with our guide Omar without any trouble. (Take walking shoes or decent trainers). The rooms all have great views and are comfortably and traditionally furnished ( the minibar is filled with soft drinks for you to help yourself), and make sure you use the Argan oil shampoo, which is wonderful for your hair! We met such interesting fellow-travellers up there: some, like us, were staying at the Kasbah and we talked after dinner about our divers lives, others had come up for the day from Marrakech (and were VERY sorry they weren’t staying longer). We all shared a belief that luxury is not only found in 5-star hotels, but is derived from being genuinely cared for, feeling safe and enjoying fabulous views. It’s a place for peace, tranquility, and time to read and dream … they have an interesting library of swap-books and I laughed at some of the arcane literature that has found its way there: A Dictionary of Homonyms, A Short History of WW II!! We left rested and very satisfied. Stayed here for the third time in February, along with 37 of my FE students . This place is truly magic and the staff go out of their way to make the students and staff part of their family. The views from the balcony are spectacular, especially at night when the stars shine bright. Breakfast lunch and dinner are great with fresh vegetables and delicious meat ,home made yoghurt freshly squeezed orange juice and local honey . We went on local walks, helped out clearing the irrigation channels and mending the paths going to the next village. We went bartering in the village shops and talked to the women in the local co operative. The Kasbah is a special place go and support its efforts to bring responsible tourism to this area. Most of the students said this was a life changing experience. The 5 day stay in the Kasbah was the highlight of our Morocco trip. The location and the surroundings are really stunning. The Kasbah has the atmosphere of a mountain resort, very relaxing and quiet. The meals are served at the roof top and are an unforgettable experience. The staff is perfect, they took care of every issue immediately (transfers, lost items in other riads, hammam, one staff member even took us down to Imlil one evening and made it possible that we could follow the European Football Championship). And if possible one should make at least the 2 day trip to the Trekking Lodge of the Kasbah, that trip really was great. At the lodge we had the best dinner of our entire trip through Morocco, the guides were great, they arranged wonderful lunches and the views were beautiful. One had to walk about 5 hours each day so a little training in advance would be recommend. The first part of the trip is rather steep. But the guides take care and offer water and if you are too exhausted you can ride on the mule. Perhaps good to know: all the drinks at the Kasbah are included in the room rate, the fridge in the room is refilled every day and they also serve tea, coffee or whatever throughout the day. Every drink is accompanied by small snacks. Important: they don't serve alcohol, so if you want some bring it with you from Marrakech or wherever. Since my trip to Borneo at the start of the year I have been on the lookout for the next opportunity to be a little closer to nature and maybe do some more trekking. When I was planning this trip and realised how close the Atlas Mountains were to Marrakesh, it seemed like the ideal solution. We booked the Rui Tikida Palmaraie in Marrakech for a week and added an overnight stay on the 29th Dec at the Kasbah as a Christmas present for my partner following recommendations from two friends that has stayed there previously. Firstly its a shame there are (very few) negative and personal comments about this amazing place and its owners. If you have any concerns, before booking, read as Mike, the owner, recommends (in his thorough feedback) the section of his website about ‘who should visit’ or read properly about what this place is. If you are the type of person that appreciate something more special than the ordinary, somewhere peaceful and truly beautiful and somewhere the was clearly a dream realised for many - and that helps many - then this is for you. The fact that this is a ‘not a hotel but a Berber Hospitality Centre’ is often written but it’s one of the loveliest and unique ‘hotels’ I’ve stayed in. We arrived in Imlil via a 90min trip from the city to incredible mountain views. Arriving at Imlil we were welcomed at the Kasbah office then escorted on the 15 min walk which is hard but worth it. The guide carries your bags - or a mule. There are village sellers on the route up but who can blame them. On arrrival the team were friendly and got us soft drinks (bring your own alcohol to the Kasbah as out of respect to the Berbers they do not serve it). Our room was in the Tower and gorgeous - about a quarter of the size of our suite in Marrakech but with four times more character including dates, oranges, berber robes and shoes and when we returned post dinner hot water bottles! Walking up the stairs onto the roof terrace earned a well deceived gasp of awe. Incredible views and for fellow skiers that incredible feeling you get eating outside in the mountains. Lunch and dinner are all set - you can request vegetarian - ok so not ideal but this was not a hotel but local Berber cooking. Both in fact for us were amazing. Soups, a tagine to die for - breakfast was not cooked but lots of effort put into it and nice. Residents are charged 15 euros for lunch and 20 for dinner - so they charge non residents 30 euros for lunch - bit cheeky - but - hey - this place is special and if you don't like the room or meal prices - then don’t come! We spent a lovely afternoon in peace in the sun and then visited the Hamman. We also spent s lovely time in the upper enclosed roof terrace with its log burner and listened to the call to prayer and watched darkness descend on the valley. Amazing. Take some time to read Reasonable Plans - a book you are given about the story of how the Kasbah came to be. Overall a truly incredible experience and one that made our trip to Marrakech complete. Room Tip: This place is designed to suit all budgets so choose the dorms with seperate bathrooms, or a standard room ensuite (in the Tower was lovely!) for great value but there are also some deluxe ones. We loved our Tower room. Unbelieveable, amazing and a social conscience in action!!! This Kasbah is SO much more amazing than you can tell before you get here!!!!!! Pictures and words just don't do it justice. It is one of those thrills of a lifetime that you just have to experience to believe. 360 views of the High Atlas right before you, trails just outside the Kasbah gate and wonderful service. This place really walks the walk with social activism. Every local that we talked to in the villages said that the Kasbah has been responsible for making all of their lives so much better. They were instramental in establishing the Village Assocaition which has established trash services in the valley, ambulances to this remote location and many other services. They have made education a reality for girls in the High Atlas valleys -- no small feat!!!!! You will be thrilled to be here and helping a good cause at the same time. This Kasbah is SO superior to the "other" celebrity Kasbah near by. That one is outside of the valley and isolated all by itself. They must have to drive their guests into the mountains to get any type of authentic experience. Kasbah du Toubkal is the real deal! A blog article from the Ciao Bambino! website. Why didn’t we come here earlier? We wanted a walking holiday with a difference - experiencing a new culture, something a little different from English Lake District. We had a weekend in Morocco followed by 2 nights in the Kasbah du Toubkal, 2 nights at their remote treking lodge and a final night at the Kasbah, with full day treks including lunch pre-booked. The web site suggested that it would be good, but I never imagined it would be sooo good! The staff run the place with relaxed efficiency and once evening meals were arranged (to be paid for on departure) everything else was included. The food was good, the Kasbah is set up to allow seclusion or the opportunity to chat to other guests—your choice. The views are fabulous - we could see Jbel Toubkal from both of our Kasbah rooms. The views from their treking lodge were even better - totally stunning and we will carry the memories of watching valley life from from the terrace for the rest of our lives. The walking and the guide were first class—the stories we’d heard of the picnics are true: we would come across the cook and his mule at lunch time, rugs and cushions set up under a shady tree and a 3-course lunch followed by snooze awaited. All absolutely first class—I’m not sure what one could compare it to. If you want a hotel with mountain views, and even better if you want a good walk or two it would be difficult to beat. My advice—pay the money and you will see that it's worth even penny. I am writing this review whilst sitting in the library in front of a roaring wood burner with no. 26 (one of the Kasbahs gorgeous kittens) sitting on my lap and to be fair, sitting partly on the keyboard. My husband and I have spent five nights/six days staying at the Kasbah in a deluxe ensuite room with outside balcony and seating area. The accommodation has been both cosy, comfortable and very welcoming especially after the trekking that we have done in the Atlas Mountains. Free soft drinks and both dried and fresh fruit have also been provided in the room every day. On our first morning we did one of the free daily welcoming walks, this was a lovely introduction to the area and the Berber way of life. You have the choice whilst staying at the Kasbah of either taking numerous walks on your own (routes are clearly marked) or paying for the guided treks which are available. The Kasbah is not a luxury five star hotel. If this is what you are looking for, visit Mr Bransons resort down the road. If you are looking for a vacation that will allow you to kick back, relax, enjoy traditional home cooked meals in a fabulous atmosphere with no pretension then this is definitely the place for you. For meals, the Kasbah provided a variety of dishes every evening and lunchtime which we thoroughly enjoyed, we actually ate in the Kasbah every night as the food was so nice. With all meals, the Kasbah provides fresh spring water that is UV treated (to be extra sure) and for the cautious, free bottled water. We drank the spring water every day with no ill effects. This is also the better environmental option as it means no disposal of plastic bottles. The Kasbah provided the use of a traditional hammam during your stay. This was extremely relaxing and unlike most of the riads in Marrakech was free for the duration of our holiday. For us, it was the staff and their hospitality who made our trip. Most of the staff are not trained hoteliers but regardless of this, they are absolutely fantastic and provide a much friendly and kinder service than most of the five star hotels that we have stayed in. We couldn't have asked for a better vacation, thank you. I collect hotel stays like spinsters collect cat figurines and Kasbah du Toubkal is the best place I’ve ever stayed. At 250euro per night for the deluxe suite, it’s not cheap, but worth every penny. …genuinely hospitable staff, gorgeous views, conducive to meeting interesting fellow travelers, thoughtful attention to detail, exceptional food. Maybe the best place I’ve ever stayed. This is a rare place. A labor of love of two men—one Berber and one English—who created a luxurious mountain haven while honoring the qualities of the local culture (food, architecture, welcoming hospitality). All the comforts are provided including a pleasing hamman (steam room); reading room ,wifi, all in a dramatic mountain setting facing the Toubkal peak (13,000 ft); great local food. Easy access to local trails into mountainside Berber villages and into the high reaches—all with Kasbah provided guides and mules. The Kasbah rates among my top-five worldwide for luxury in an exceptional traditional rural setting (in this case mountainous). Scorcese’s Kundun (Dalai Lama) was filmed in Morocco and parts at the Kasbah. The Kasbah has been described as “not so much a hotel - more of a Berber hospitality experience”. My wife and I discovered that this is NOT pretentious waffle, but a very good description of what has been, for us, a unique and wonderful experience. The setting is exceptional - the Kasbah is on a small outcrop at about the level of the tree-line, at the confluence of several small valleys. Whichever way you look, the views are stunning with woodland, waterfalls, moluntains and small Berber villages all around you. We had a standard room which was at the top of a small tower and had its own roof terrace, where we could ascend with a hot drink in the cool of the early morning to watch the sun creep over the mountains before bathing the slopes below. Timeless and magical. The room itself was traditional, not luxurious, but very comfortably and pleasantly furnished. Fresh fruit, non-alcoholic drinks, dates, figs and assorted nuts were provided along with bottled water and facilities for brewing those early morning hot drinks. Surprise facilities included a cd-player, an i-pod docking station and traditional leather slippers and jbebel(?) for our use during our stay. Food was again, excellent, being primarily traditional Berber dishes such as salads, tagines and cous cous, but beautifully cooked and incredibly tasty. I don't think we managed to finish a single meal, given the quantities. Breakfast was a semi-buffet affair with cereal, fruit, yoghourt, pancakes, eggs and lovely home-baked bread. The outstanding feature for us, though, was the friendliness and hospitality of the people we met - both the staff within the Kasbah (where the service was outstanding)and the villagers, moving back and forth along the various mule tracks. All were very open, polite, interested and interesting. Even the shopkeepers (who we have found very pushy in some places) seemed more interested in arriving at a mutually beneficial arrangement than extorting every last dirham - shopping was actually an enjoyable experience. Having said all that, I don’t think the Kasbah will be for everybody. If you need to be surrounded by luxury; if you want to lounge around a pool in swimming kit; if you want lively entertainment and shows; if you want to hang around in bars; if you believe that staff are modern-day servants; if you like to drive everywhere, then this is not likely to be your sort of place. If you appreciate an opportunity to simply relax; if you are interested in learning about a culture, rather than imposing your own; if you are reasonably fit and love walking in woods and mountains; if you enjoy simple food, from fresh ingredients, beautifully cooked; if you like engaging with local people in a low-key, non-intrusive way; if you want to feel like a guest, rather than a client, then the Kasbah might suit you very well. We booked through Discover Ltd but did make direct contact with the Kasbah before we went and all these preliminary contacts set the tone for our stay All arrangements, including the car transfer from Marrakech to Imlil, worked exactly as we were told (except the return mule down to Imlil, which was 15 minutes late!). We never return to the places we visit (except Venice!) but will be returning to the Kasbah as soon as we are able. My wife and I recently stayed at the Kasbah (4th to 8th June 2009) and wanted to say what a wonderful time we had there. The setting, the accommodation, the food and the environment were absolutely outstanding. What made the trip most memorable, however, was the warm welcome that we experienced—not only from the staff but also from the people we encountered on the surrounding trails. A very big thank you to all concerned. We tend not to return to places visited, as the world has so much to offer, but have promised ourselves that the Kasbah will be an exception. Kasbah du Toubkal seems to receive a mixture of reviews, the majority fantastic but some poor. I can understand the different viewpoints but can only offer comments on our experience. My fiance and I stayed two nights in the Garden House to celebrate our engagement. The room was undoubtedly very expensive, and well beyond what I've ever spent on accommodation before anywhere in the world, but WOW what a place. The Garden House is absolutely stunning. It’s located a little down from the main buildings which makes it very quiet and secluded, certainly totally away from the bustle and hassle others have complained about. The apartment itself is stunning, with breathtaking views out to Toubkal and across the valley. Furnishings were simple but beautiful. The apartment itself is huge with lovely kitchen, two dining tables, sofas around a cosy wood fire and lovely bedroom downstairs. There are even stunning views from the bathtub! We really did spend much of our two days open mouthed at how beautiful the views were and what an utterly amazing place we were staying in. We had all our meals in the Garden House and staff were warm and friendly, attentive but without being intrusive in any way. The hospitality lived up to everything stated by the hotel and it meant a wonderful combination of luxury without the snootyness some five star hotels can have. We loved it and can only praise our experience most highly. We will never forget it. Clearly the price means this won't be for many people, but if you are looking for a very special experience for honeymoon, engagement or anniversary this place is absolutely fantastic. Loved it. Just a final comment on Kasbah Tamadot (Richard Branson’s place) as some people have compared the two. We had lunch there on the way to Kasbah du Toubkal and Tamadot arranged all our transfers from Marrakech and up to Imlil. The experience was also very good. Staff extremely professional but friendly and relaxed too, very good service and nice setting but nothing on Kasbah du Toubkal. It struck me that these are two very different places catering to slightly different markets though we did see some people at both. Do choose carefully. However, for me, we got a stunning apartment for the price of regular rooms at Kasbah Tamadot and it was the right choice. “I would like to emphasise what a special place you have created; with caring staff, beautiful scenery, tasty food and an enchanting atmosphere. We loved our stay, it was such a tonic and I can’t wait to return next year…this time to climb Toubkal. Of the glory it had seen. It stands proudly once again. That all around us is displayed. Upon the Earth God has perfected. And the people of each nation. That’s always there to walk beside. “We have lived in five or six star hotels before and have also stayed in half-star budget accommodation. But none of those is akin to this Kasbah, for everything here (including the decoration and setting, the services and the atmosphere) are just right to put you at ease. “The architecture ‘sub-merges’ into the mountains and the history as well as the contribution the Kasbah did to the nearby local villages is also remarkable. We are impressed with the insight/vision of Discover Ltd.
“My husband and I received a stay at the Kasbah du Toubkal as a wedding gift. Our three days here have truly been a magnificent way to explore the natural beauty of the maghreb and to understand the culture and lifestyle of the Berber people, whose history is so central to Morocco, our new home. This trip has opened my eyes to what a wonderful experience it is to spend a year in this fascinating country. Many thanks to the Kasbah du Toubkal and especially to our guide Houssein for introducing us to a new way of seeing the world. “Thank you for the wonderful trip. This was a far better experience than we had dreamed of. Our guide Mohammed and the two muleteers were always helpful and fun and took care of our every need. The mint tea and food were exceptional. “The greatest strength of the Kasbah (greater even than the stunning location) is the people who live and work there. The rooms are superb, the food was a wonderfully rewarding adventure for us, the roof terrace is my favourite place in the world. “I still find it hard to believe that in three days we achieved so much in such an unhurried and positive environment. The climb to the summit of Mount Toubkal was a life enhancing experience that will always be with me. “I always knew that we needed an extraordinary venue to do our work on relationships and business possibilities. The ideal place would have two main characteristics. First it would be in a geographical location which inspired awe so as to put issues and problems into perspective and create conversations that would not take place in more normal surroundings – mountains or deserts seemed likely. Second the local culture would be very different from the UK; experiencing a very different set of values in action is a great way to focus on culture and behaviour. The Kasbah du Toubkal has both of these characteristics in abundance and has the additional bonuses which we could not have envisaged. The local culture and values are at work within the kasbah itself the place is a manifestation of Berber hospitality, personally warm and welcoming. We did not need to arrange encounters with local culture, we lived in it for a week. In addition the accommodation, in what can be politely described as the middle of nowhere, was terrific. Comfortable rooms, great food and good working/conference facilities.